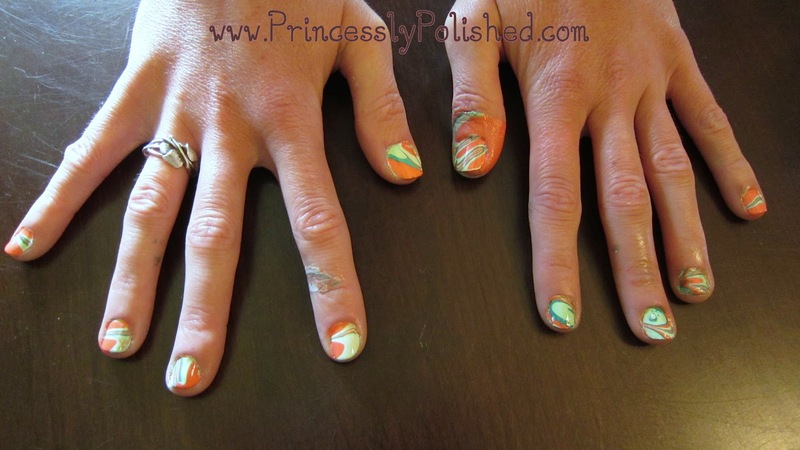 Princessly Polished: Vacation's-End Water Marble Manicure Party! 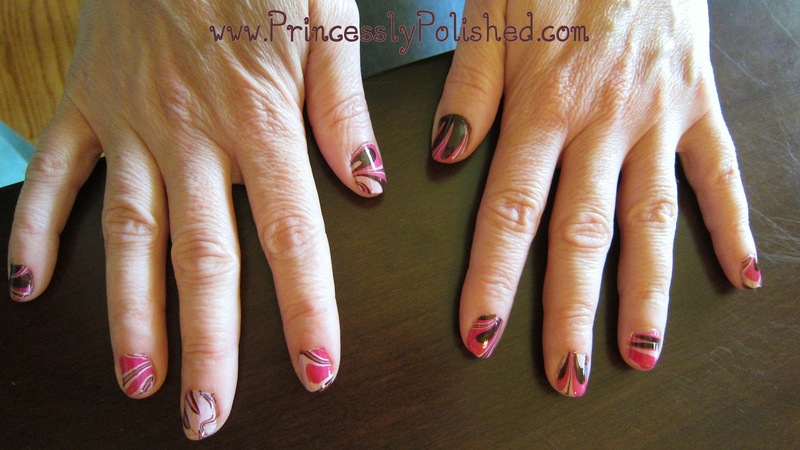 Vacation's-End Water Marble Manicure Party! First off I spent time before the party practicing my marbling skills. This was helpful because I needed to feel comfortable, and I was able to test polishes to bring with me to the party. I tried to make many different styles of marble designs to show what a variety you can get. Everybody got to look at these beforehand for some inspiration. My grandmother is awesome. 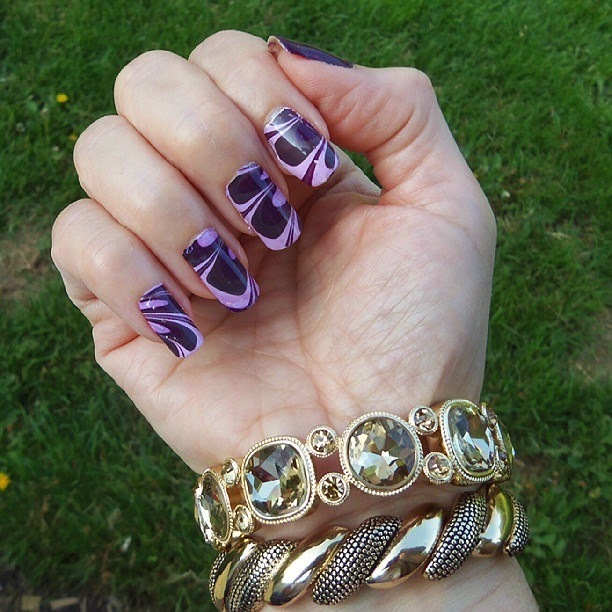 Not one of those ladies to go get a boring manicure from a salon, she does her own nails and comes up with great layering combinations. Now, she water marbles! (Yes, I have had quite the influence on her.) Her nails look great and she's definitely getting the hang of it! I can't wait to see what she tries next. My friend and fellow polisher Michelle snapped up these sparkly glass-fleck hues that look fantastic together, and especially good on her! 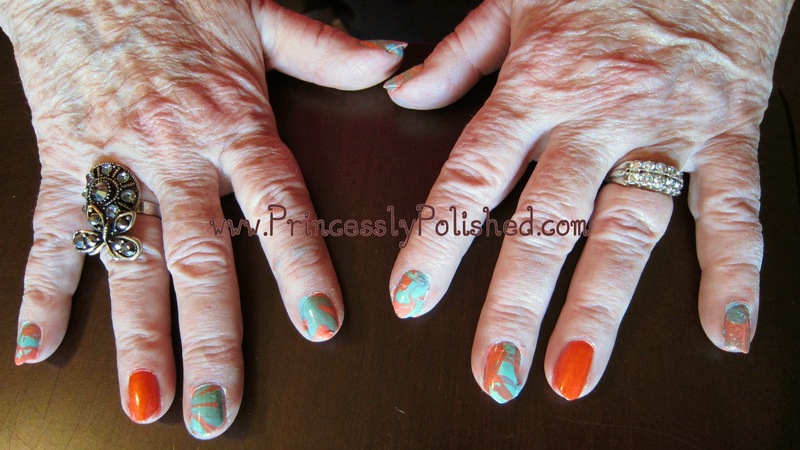 She did the more conservative "marbled nails as accent nails" approach, which left her with more time for clean up afterwards. I'm inspired to try a manicure like this some time! She started off with her own Zoya colors that refused to marble on the water, so I switched her to some of my Essie polishes that would give a similar look. 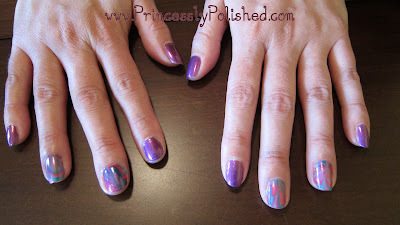 (The sad truth is that not every polish works for water marbling.) Fortunately these shades are super easy to marble with and she ended up happy! I think we could vote her nails as Most Swirly; she went for an every-nail-unique look. Ruth got away before I could take a pre-clean up photo. Don't let her professional after shot fool you - she had the most polish on her hands! ;D But wow, this sure doesn't look like a first time water marble, either - these nails are great! And rather than fight with marbling her thumbs she painted them solid. I was going for a marbled rainbow gradient, and I'm pleased with the effect, though I think I could have picked some better colors. The colors, from top to bottom are China Glaze Light As Air, Something Sweet, Peachy Keen, Lemon Fizz, Re-fresh Mint and Bahamian Escape. I love this post! 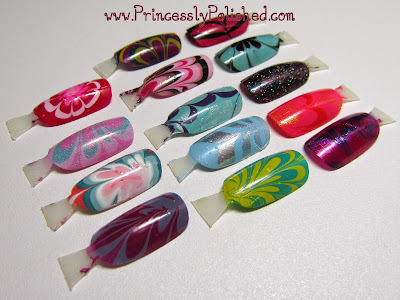 Marbling is amazing and you're great! :) Thanks for sharing. And congratulations on your first "nice" one; I know exactly what you mean by that! 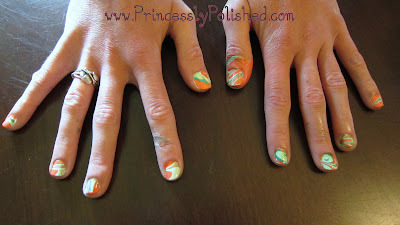 Pastel Flowery Water Marble & Glitter Nail! Back From My Break... To Go On Vacation!